What is Infantile Seborrhoeic Dermatitis or Cradle Cap? Seborrhoeic Dermatitis, is a yellowish, patchy, greasy, scaly and crusty skin rash that occurs on the scalp as well as on other parts like ears, eyebrows, eyelids and nose. 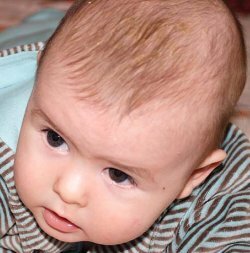 Cradle Cap is the term used to describe this disorder when it affects the scalp of newborns. It is harmless and is usually not itchy. It is most common during the baby's early months. How to treat your baby's cradle cap? Gently brush your baby's scalp with a soft brush or washcloth to loosen the scales. When my baby had cradle cap, his scales didn't become loose easily so I found, like other parents, that rubbing a baby oil onto my baby's scalp was helpful. Rub your baby's scalp with a small amount of baby oil or olive oil. Let it soak into the scales for about 15 minutes. Wash your baby's scalp with a mild baby shampoo. Do not leave the oil in your baby's hair because the scales may accumulate and worsen the cradle cap. How to prevent a cradle cap? A gentle wash of your baby's hair two or three times a week with a mild shampoo should be sufficient. When to call baby's pediatrician for cradle cap? If your baby's cradle cap doesn't improve with your home treatment or starts to spread, do call your baby's pediatrician.